Courtney R. Riggins is a native of Jacksonville, Florida and currently resides in Tampa, Florida. She attends New Dawn Restoration Center under the leadership of Reverend Dr. Julia M. McMillan. With a heart for today’s youth, Ms. Riggins is the founder of Raise Your V.O.I.C.E. (Veering Our youth towards Identifying their passion, Cultivating their gifts, and Elevating them to their purpose) Inc. which is a non profit organization that helps at risk youth find and fulfill their God given purpose through hands on activities, family engagement, and mentorship. She is also the founder of I Am Virtue Inc. a non profit organization that encourages girls ages 8-18 to become the beautiful proverbial woman through life skill classes, team building, Bible studies and discussion as well as mentorship and community service. 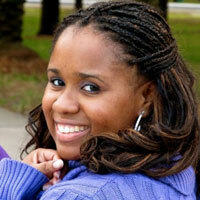 Ms. Riggins earned 2 Bachelors degrees in Psychology and Political Science from the University of South Florida. She is currently pursuing her Masters in Professional Counseling at Liberty University.